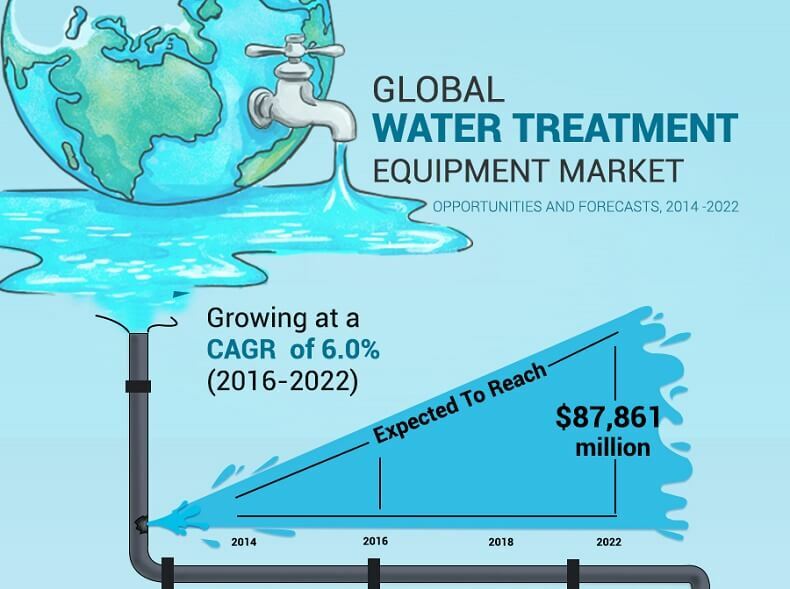 Water Treatment Equipment Market is expected to garner $87,861 million by 2022, registering a CAGR of 6.0% during the forecast period 2016&dash;2022. Water constitutes an essential part for community well-being. Water is a universal solvent, but solids, such as clay, fine sand, dust, and rust are insoluble in water, resulting in cloudiness and are technically known as total suspended solids (TSS). Water treatment is carried out to decrease the TSS levels as per the end-user requirement, and hence differ depending on the factors such as TSS level, location, and application. Removal of suspended solids and microorganisms is done by differentiating the chemical, physical, and biological properties of water and its constituents. Water treatment equipment are chosen based on the properties of constituents such as density, quantity, chemical reactivity, boiling point, solubility, melting point, volatility, purity level of water, and similar others. This was due to increasing consumption of water, stringent government regulations regarding the TSS level, and rising industrialization worldwide. However, the higher cost of the equipment is expected to restrain the market growth during the analysis period. 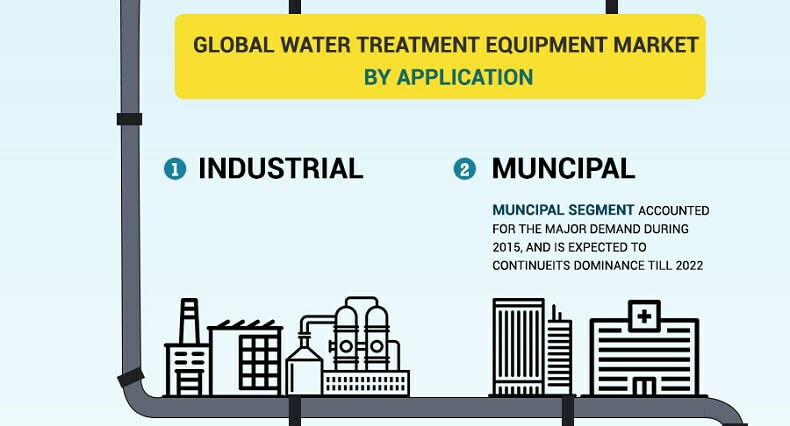 The market for water treatment equipment is segmented on the basis of end user, type, and geography. Based on the type of equipment, it is categorized into process equipment, mud treatment, filtration systems & media, disinfection, diversions & screens, meters, membranes, and others. In the year 2014, process equipment occupied highest share of in the overall water treatment equipment market and is expected to maintain its lead throughout the analysis period. Process equipment are used to manage industrial effluents. Key factors driving the growth of the water treatment equipment market size are the stringent regulations regarding wastewater and sludge disposal. However, the membrane type segment is expected to register highest CAGR during the analysis period. On the basis of end user, the market is segmented into industrial and municipal. In addition, each end-user segment is further segmented into type of water to be treated as water, waste water, and sludge. In the year 2014, the municipal segment occupied three-fifth of the total market and is expected to maintain its share throughout the analysis period. Further, equipment used for the treatment of industrial sludge is expected to grow at a highest CAGR of 8.0% during the forecast period. Geographically, the market is segmented into North America, Europe, Asia-Pacific, and LAMEA. Asia-Pacific was the highest consumer of water purification equipment and is expected to maintain its position throughout the analysis period. In Asia-Pacific, the factors supplementing the market growth are the increasing population and rising awareness regarding consumption of safe, potable water. Major companies profiled in the report are Accepta Ltd., Ashland Inc., Calgon Carbon Corporation, Danaher Corporation, Ecolab Inc., Kemira Oyj, Veolia Environment SA, Hyflux Ltd., and The Dow Chemical Company. Industrial water treatment is important in order to comply with several governmental and environmental regulations associated with industrial wastewater discharge. In industries, water is treated prior to its use is called process water treatment while the treatment of water produced after manufacturing process is called as wastewater treatment. The wastewater treatment equipment is employed in different industries, such as power generation, refineries, pulp & paper, metal & mining, food & beverages, oil & gas, sugar including others. Municipal water treatment includes the treatment of drinking water, municipal wastewater, and also treatment of swimming pool and bottled water. Water is an important source for several household work, drinking purposes, and manufacturing processes in numerous end-use industries. Increasing population and industries across the globe have created the need for water treatment in order to recycle and reuse the wastewater. On the basis of geography, the global water treatment chemicals market is segmented into North America, Europe, Asia-Pacific and LAMEA. Asia-Pacific is the leading region accounted for 32.8% of the total market in 2015, owing to the rapid growth in industrial sector and adoption of water treatment processes in order to meet the required water quality standards. 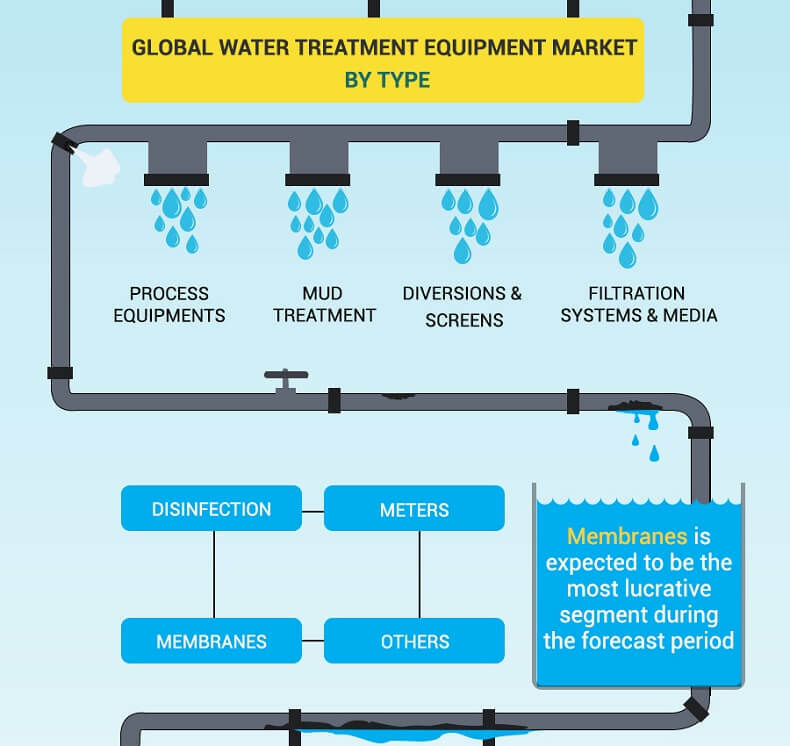 The key players in the global water treatment equipment market are adopting different key business strategies, such as product launch, agreement, acquisition, collaboration, joint venture, and merger to withstand in the global competitive market. The market players profiled in this report are water treatment equipment manufacturers and solution providers who serve the product globally to several end-user industries. The data pertaining to market players and their strategic moves are gathered through press releases of respective companies and various blogs available on the website and primary calls made to the experts in the industry. The above pie chart represents the percentages split of the strategies adopted by the top companies operating in the global market. Acquisition and agreement are the leading strategies adopted by the key players in this market in order to widen their market reach in water treatment equipment market. Acquisition covers 33% share out of the total number of strategies adopted during 2011-2016. BASF and Degremont group are the leading companies, which have adopted acquisition as their key business strategy. 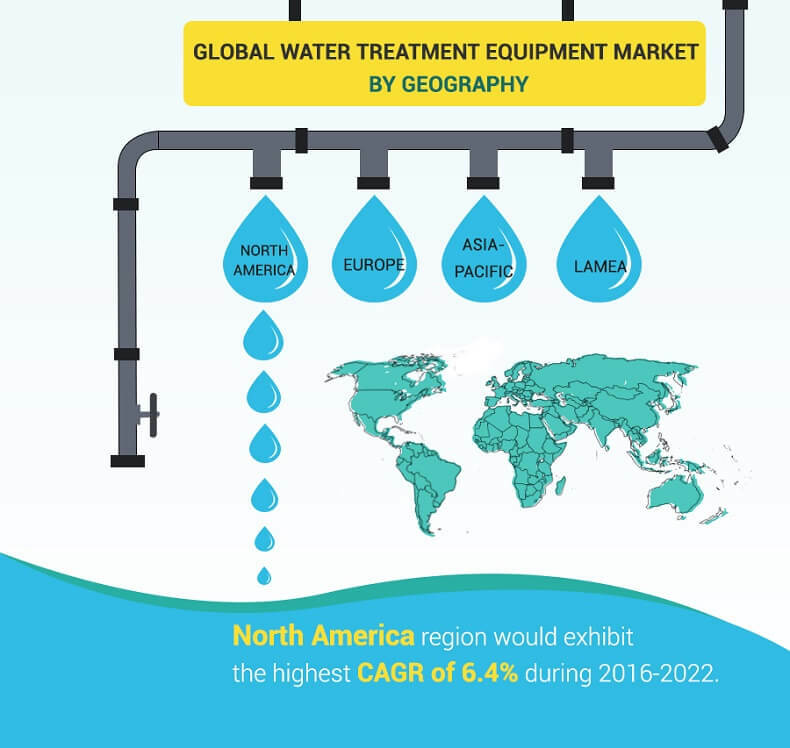 Veolia Environment SA, Hyflux Ltd., Xylem Inc., Pentair PLC, Degremont Group, GE Power, and VA Tech Wabag are the prominent companies who have adopted several key business strategies to increase their market share in global water treatment equipment market. The companies have employed agreement, acquisition, collaboration, joint venture, and product launch in order to gain competitive advantage in this market. Xylem Inc., and Degremont Group have primarily adopted acquisition as a strategy that helped it to expand its geographic reach and distribute its products in Mexico, Central America, Midwestern United States and Canada. The report includes an extensive analysis of the factors driving as well as restraining the global water treatment equipment market. The market projections from 2014 to 2022 have been included along with factors affecting the same. The report also provides quantitative as well as qualitative trends to help the stakeholders in understanding the situations prevailing in the market. An in-depth analysis of key segments of the market demonstrates the stakeholders with water treatment equipment usage for different applications across various end-user industries. SWOT analysis helps in understanding the internal environment of the leading companies for strategy formulation. Competitive intelligence highlights the business practices followed by the key players across various geographies. 7.10 VA TECH WABAG LTD.